When it comes to social media icons, it's definitely important that you get the right design, color, size, and of course, the aesthetic layout. While there are many types of icons out there, you might be interested in flat icons which are simple, elegant, and impressive in design. In this post, we'll explore some of the best flat social media icons available on the internet today. Not to worry of spending money as all the icons included here are free and yet of great quality. These can be useful for your blog, portfolio or website. Take a good look and I'm pretty sure you will find what you are looking for in this list! Need help with installing icons to your website? click here. This pack contains 24 icons including the most popular social media networks: Google+, Youtube, Instagram, Pinterest, Twitter, Facebook, etc. They're available in 4 different sizes: 16px X 16px / 32px X 32px / 64px X 64px / 128px X 128px. 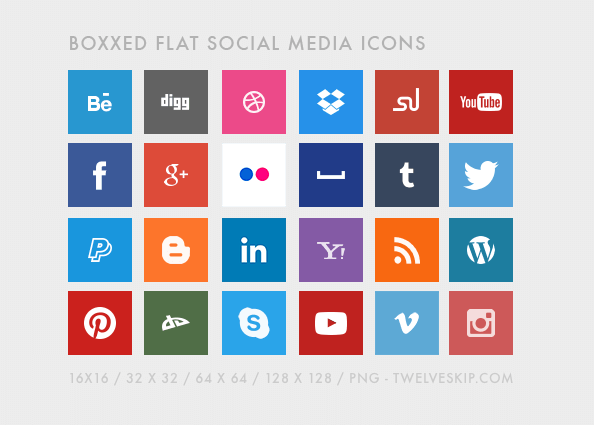 This set of social media icons comes with 45 sleek flat icons and available in PSD format. This free icon set created by Jellyish comes with full PSD, and PNG icons. Available sizes: 32 x 32, 64 x 64, 128 x 128. This super cool icon set comes with fully editable PSD format, with a sizeof 114px x 114px. Found this on Dribbble! This set comes with 8 icons in PSD format with including the most popular social networks. This beautiful pack contains 20 icons in PNG format with a size of 64px x 64px. Almost every social networking sites are included in this pack. Most popular ones are Ebay, Twitter, Skype, Instagram, Dropbox, Wordpress, Google Plus, Youtube, Pinterest, Yahoo, Tumblr, Facebook, and more much! This pack contains 150+ various icons in PNG format. Available in 5 different sizes: 512 / 256 / 128 / 64 / 48. Another great quality flat design icons by a Deviantart user, Martz90! Available in 512x512 / 256x256 / 128x128 / 96x96 / 72x72 in pixels. This awesome set made by Mohammed contains 24 icons and comes in 5 sizes (512px to 16px) in 3 different formats PNG, AI and EPS. I'm in love with these! I'll definitely use this pack on my next website project. A minimalist flat designed social media icons by a Dribbble artist, Jorge Calvo. It contains 72 icons which you can used for personal and commercial projects. This one contains 24 fully editable icons in flat round, square, rounded corners and long square shape. Comes in Ai X EPS file. This set comes with PNG format in 3 different sizes - 32 x 32, 64 x 64, 128 x 128. Dustn's icon set contains 6 sets of 15 social media icons. Total of 90 icons. This set is available in colored and gray versions, and it comes with PSD and PNG format in size 48 x 48 pixels. Proudly made by me for Oneextrapixel. Available in PNG format, and they come in sizes 32px X 32px, 64px x 64px and 128px x 128px. This icon set by KPL IT Solutions contains 30 icons in 5 different sizes. This geeky icon set by Abdulrahim Bajaber contains 40 flat icons and available in PSD format. Download the free version for the social icons. This set comes in 45 different sizers - 512px, 256px, 128px, 64px and 32px and all are 100% resizable vector shapes. Want an icon set installed to your site?